Sleep is more than a necessity and a mattress should represent something more than utility. Beautyrest Black®is where technology and luxury intertwine to take you far beyond mere comfort. It’s about sleep that indulges the senses. Sleep that refuses to compromise. Sleep that’s so completely restorative and inspiring, it borders on the sacred. Explore the distinctive elements that compose the Beautyrest Black sleep experience. At gotomattress.com we have the entier Black collection at the lowest prices available. Our prices include free delivery, set-up, removal and NO SALES TAX! Please email us to see if we have any coupons that may apply. The Simmons Beautyrest Black Katarina Pillow top is available in 2 different comfort choices. Posted in Beautyrest Black, Best Mattresses, Black, Euro Pillow Top, Euro Pillow Top Mattresses, Innerspring Mattresses, macys, Mattress Name Comparisons, Pillow Top, Pillow Top Mattresses, Simmons Beautyrest. Beautyrest Black Evie name comparison. Most people don’t know that mattress companies use many names for the exact same mattress. For example The Beautyrest Black Evie is the same as the Simmons Beautyrest Whitten as seen at Macys. We can help you cut through the confusion and find the bed you want. Call us at 1-800-385-8319 and our experts will help you match the mattress you are considering. The Beautyrest Evie or the Beautyrest Whitten come in a choice of comfort. You can pick from a firm Pillow top or a Plush Pillow top. They are both the same price just a choice between a d firm or plush feel. Here are links to these mattresses on our Gotomattress.com web site. You may qualify for additional discounts or promotions based on your selection and location. To find out if you qualify, click the button below. Have you seen the new Beautyrest Black line? The Black is loaded with the best and newest technology. One of my favorite Mattresses in the Black line up is the Beautyrest Black Kate Luxury Firm Pillowtop or the Plush Pillowtop. Here are just a few of the features. Since the Kate comes in either a Firm Pillow top or a Plush Pillow top you are bound to love one the comfort options. Here is a link to both of these mattress on our Gotomattress.com web site. The Kate is also known at the Simmons Beautyrest Black Torrence as seen at Macys. It’s also, found under a few other names as well. Beautyrest Black Oceanside Extra Firm name comparison! From Macys..
Have you seen the Beautyrest Black Oceanside Extra Firm from Macys? Did you know that same bed is available from Gotomattress.com? Sleep on…and on. Combining Sleep Climate™ Surface Technology, GelTouch™ & Dynamic Response™ Memory Foam, this mattress keeps you cool through the night, provides pressure relief & sets you up with conforming & comfortable back support. Did we mention Tax Free! Get additional savings since Gotomattress.com does not collect state sales tax on any deliveries in the United States. Simmons Recharge Fischer Island Luxury Firm as seen at Mattress Firm. Do you have the Simmons Recharge Fischer Island Luxury Firm as seen at Mattress Firm? To answer that question Barbra I have to let you in on a little know secret in the mattress business. Did you know that manufactures give out different names to different stores for the same mattress. This Simmons Recharge Fischer Island Luxury Firm is the perfect example. The Simmons Recharge Fischer Island Luxury Firm as seen at Mattress Firm is the same as our the Simmons Recharge Flatbrook Luxury Firm. As a matter of fact the Flatbook is available in 5 different comfort levels. Simmons offers these 5 different comfort levels to give everyone a comfort level that’s just right of their individual needs. If you’re a side sleep, back sleeper or stomach you can find a comfort level that’s just right for you. Most people don’t know that mattress companies use many names for the exact same mattress.We can help you cut through the confusion and find the bed you want. Call us at 1-800-385-8319 and our experts will help you match the mattress you are considering. The Simmons Beautyrest World Class Shakespeare as seen in a major chain of Sleep Shops is the same as our Simmons Beautyrest World Class Annapolis. It’s not uncommon for mattress stores to have the different names for the same mattress. 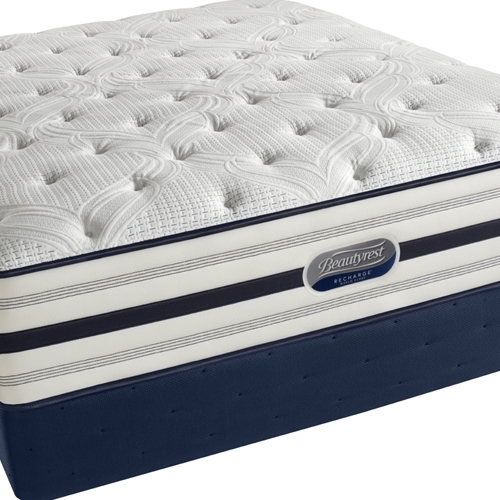 For example the Simmons Beautyrest World Class Shakespeare comes in 5 different comfort levels each on the same as our Simmons Beautyrest World Class Annapolis. Here are a list of each comfort level and lain to check them out. The TruTemp Gel Memory Foam Layer is the best feature in the new World Class. This product is not only durable with pressure relieving characteristics but also includes temperature regulation from phase change material. The Phase change material help pull the heat away from your body when needed. Another great feature comes from the Advanced Pocketed Coil system. This system does an excellent job of reducing motion transfer between couples. If your partner tosses and turns all night this will help to minimize any disturbance. Gotomattress.com has built the company on unparalled customer service and satisfaction. We are committed to providing outstanding customer service and personal attention to every detail. Gotomattress.com does its best to answer each call with a helpful sales associate ready to answer all of your questions. In the event you get a recording we will return all calls as soon as possible. Our delivery team will track your purchase very closely from the moment you place your order to the moment it arrives at your home. Beautyrest Black, living life fully charged! Simmons Beautyrest Black series. Living life fully charged. Gotomattress.com is proud to offer the Beautyrest Black. Only select dealer are granted permission to offer the Black line. This exclusive line up is the best of the best. Pamper yourself with quality and comfort. pillow tops makes the sleep experience unforgettable.